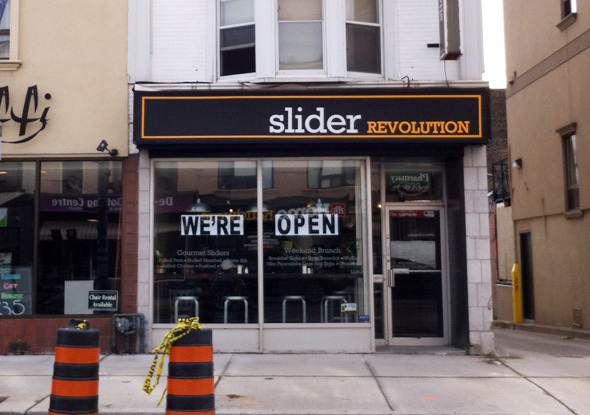 Slider Revolution, frontrunners of the micro-sandwich frontier, opened a few months ago and have been busy queuing up a veritable carousel of sliders for the Pape-Danforth neighbourhood to rotate through. While the portions here may be scaled-down, a glimpse of the menu reveals an upsize elsewhere: a whopping 17 original, regular and premium sliders fill the menu. That's well over a hundred unique two-slider combinations for those of you out there crunching sliders, er, numbers. If you go the two-slider combo route ($10.75-$12.25), and I highly suggest you do, you'll probably need to go at least a few times to single out your dream team duo. 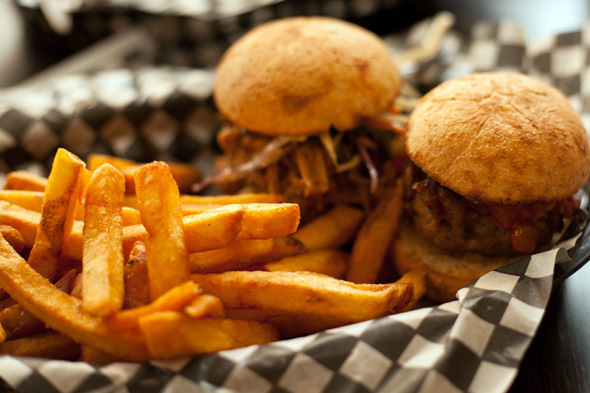 Most people will skip over the forthright burger slider, a usual sight on the pub circuit, and switch it up for atypical slider meat choices such as goat cheese-stuffed lamb meatball ($4.00), tangy BBQ pulled chicken ($4.00), or even lemon caper crab cake ($4.50). Going with whole wheat buns, our favourites were the smoked-cheddar stuff prime rib meatball slider ($4.00) laden with caramelised onions and tomato relish, and the AAA prime rib philly steak topped with provolone and horseradish slaw. The shuddering gush of cheese, sauce, and juices fused just fine. Other sliders we tried, however, weren't as successful. 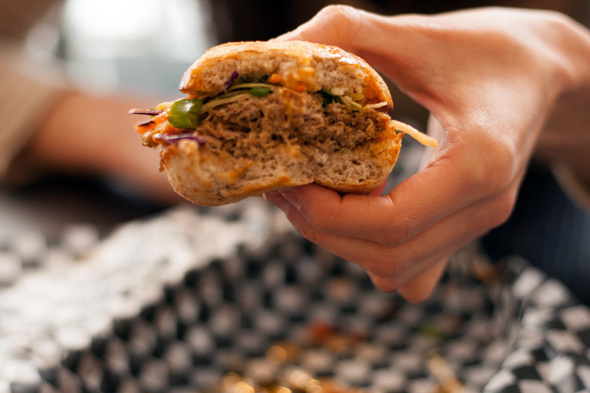 The spicy-jerk pulled chicken ($4.00) and the mu-shu pulled pork with hoisin sauce ($3.75), showed lively flavour profiles, but were less saucy which meant less bun absorption, each bite as dry as the last. Neither mango nor Asian slaw respectively could resuscitate the right amount of moisture. While hit and miss, sliders are obviously Slider Revolution's mainstay but we were pleasantly thrilled with the vast choice of sides ($2.95-$3.95). Slider Revolution's slaw selection of honey mustard, kimchee, and cilantro versions, to name a few, show real flair in this category, and their jumbo-cut fries, and herbed Yukon Gold potato chips were equally impressive. Plus at weekend brunch the game is rewritten entirely, expanded to include sausage, lox, wild mushroom western, or shrimp and lobster breakfast sliders. Expect at least a ten minute wait, but whether you only get a single slider or go the one-two punch, you'll be wondering why only a handful of places, such as Two Bite Saloon , are going the way of the mini.